Organized closets are my trademark, and any organizational plan must begin with the closet. For this blog post in video form, please head to my YouTube channel or check the bottom of this post. Are you stuck on how to organize your closet. This is one of my favorite things to write about so I am excited to share my tried and tested tips. Organized closets are my trademark and I know any organizational plan must begin with the closet, as it’s the first thing you see after you wake up. 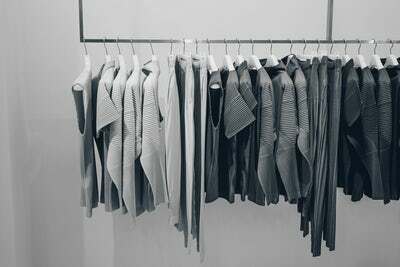 The closet sets the mood for entire day. It’s also an ideal place to practice and hone organizing skills that can transfer over to the rest of your goals. I believe that if you start your day choosing clothes from a laser-focused closet, you’re well on your way to a structured, system-driven office space. No one’s home or office needs to be perfect. But these spaces should reflect your priorities— the life you want, and what you want to accomplish. In my book I have an entire chapter on closet organizing and I am giving away this chapter for reading today. First, how much space do you have? Do your clothes currently fit where they are, or are they all squished together? Do you have enough space for folded items? Do you know what items to fold and what to hang? Do you have drawers or items such as socks and underwear? You will need to adjust your closet based on your space, what types of clothes you have, and, of course, how many clothes you have. To reiterate my organizing mantra: your organized closet needs to fit your lifestyle. My signature organizing e-course helps to really break down the planning and fitting it into your lifestyle. If your perfect closet is filled with wire hangers from the dry cleaner, then it’s not perfect. Wire hangers do not make your clothes happy. If you’re still using wire hangers, I would strongly advise you to round them up, and bring them to the dry cleaners. If they don’t take them back, donate or recycle them. The most important thing is to get rid of them—as quickly and decisively as possible. Quality hangers will last a lifetime, and are essential for preserving your clothing. If you’re buying quality hangers for the first time, it can be expensive, so you might to want go in stages. Tackle your best or favourite items first; for instance, you could start with enough wooden hangers for your blazers, and then expand from there. As usual: after you determine your budget, you have to assess how much space you have. As wooden hangers take up allot of space so you might need to consider skinnier felt ones that also serve a great purpose. Have you ever grabbed a sweater that you normally hang, and noticed two little indents on the shoulder? Have you ever had to frantically iron a delicate camisole that was wrinkled after it was folded? Learning what to hang and what to fold can be a bit of a trial and error process; I learned what to do over time after making the above mistakes, and many others, with too many beloved items. I especially remember how disappointed I was when I wanted to wear my Grade 8 graduation gown again a year later, and found that it no longer fit properly after the heavy, sparkly, spandex material was left hanging for such a long time. In hindsight, it was probably a good thing that the gown didn’t fit, since it looked exactly like it sounds—in other words, like a major fashion mistake. Still, though, this experience taught me about how important it is to make sure you’re storing your clothes properly. Now I have a comprehensive set of rules about what to hang and what to fold based on the fabrics and the manufacturer’s recommendations. There will, of course, always be exceptions, but I’ll think you’ll find that most of the things you own will fit into the rules I outlined to the right. Now that we’ve covered the basics of what to hang, what to fold, and how to care for your clothes, we need to address the odds and ends—stuff like scarves, belts, swimsuits, underwear, and jewelry. But also stuff like activewear, which poses its own challenges relative to work clothes and formal wear. I am sharing all sorts of tricks for these in the download below! These tricks I’ve learned and used over the years for dealing with these odds and ends, some of which I’ve gleaned from organizing gurus, and some of which I’ve developed from simply using items around the house as organizing tools. One thing is for sure I am still waiting to have my dream walk in complete with a separate walk in closet like Khloe Kardashian. I didn’t include shoes and handbags in this as the video would have been too long! I will sharing my handbag storage and also a special feature for taking care of luxury handbags in an upcoming video. Next week I will be sharing come key makeup organizing techniques. Ten tips to motivate you to get and stay organized! © Copyright 2018. Organized Jane.